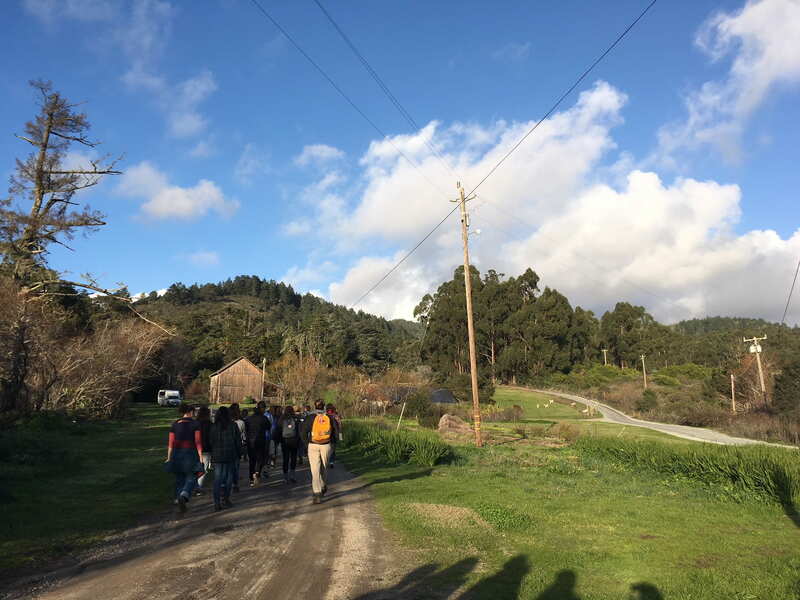 The IHP Rethinking Food Security group on a tour of Pie Ranch, an educational organic farm that focuses on teaching food justice principles to children and adults alike. My group consists of 20 students, our Trustee’s Fellow Sarah, and our Traveling Faculty member Lowery. I knew study abroad would be a great opportunity for me to learn how to admit and recognize all the things I don’t know. What I wasn’t expecting was that I would get lots of great practice learning to say “I don’t know” before I even departed for my program. After learning about my admission to the IHP Rethinking Food Security Program, I found myself constantly fumbling when trying to explain the complexity of what I would be doing for the next semester to my family and friends. I’d start with the basics, I’d be studying food security in four different countries: the United States, Malawi, India, and Italy. And I could definitely explain the basics like I would be staying in homestays, taking four classes, engaging in experiential learning through site visits, and staying with the same group of students for the whole trip. But the answer to many more in-depth questions were harder to navigate: “What will your classes be like?” “How will your days look like?” “How much freedom will you have?” The only answer I could give with certainty was a simple “I don’t know”. Part of this was a dilemma of my own making, mostly because I didn’t seek out any of the resources available to me to better understand the intricacies of program. Something I didn’t anticipate was how difficult it can be to study abroad in the spring and juggle my application to the program, my petition of the program to Amherst, and figuring out my financial aid all on top of my usual busy Amherst schedule. By the time I’d gotten everything sorted it was finals time, then time to go home, then time to embark on my journey. Another aspect is just the complexity of the program itself, the nature of an experiential learning program is hard to understand namely because its difficult to navigate with so many moving pieces. Luckily, we had a pretty in-depth orientation at our launch site in Berkeley to prep us for the semester ahead. Hopefully I’ll be able to explain some interesting aspects of the program so my next few blog posts will make a little more sense! My classmate Hannah pulling weeds at Gill Tract, an organic community garden in Berkeley. 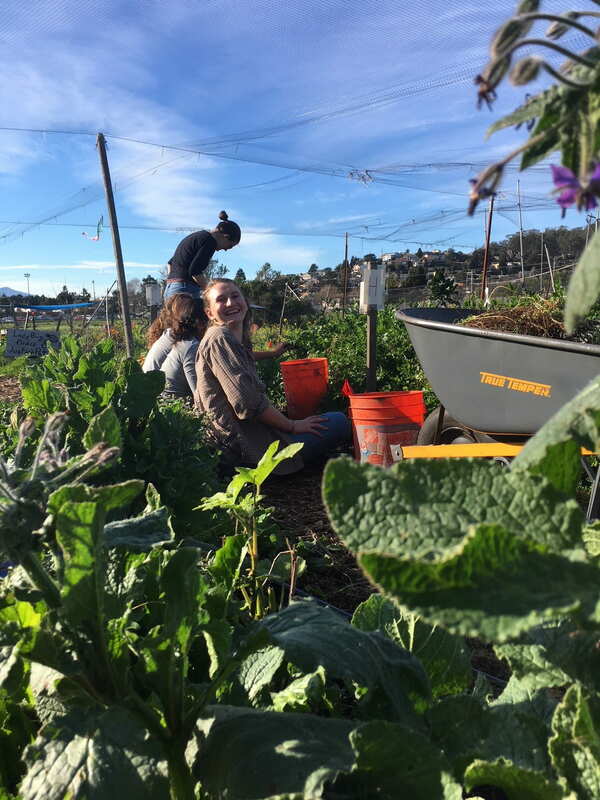 At many of our site visits in Berkeley we were able to get our hands dirty and learn a little about organic practices. Not pictured: me using a broad fork for the first time! As students of the IHP program we take four courses. The courses in the Rethinking Food Security program are Anthropology, Political Science, Economics, and Environmental Science. Political Science and Economics are taught by our wonderful traveling professor, Lowery, who will stay with us through the entirety of the program. Our Anthropology and Environmental Science classes are taught jointly by different local faculty in each of the countries we visit. For the most part, these classes resemble classes I took at Amherst with a mixture of lecture and discussion components. The workload is a bit lighter than I’m used to with less than a hundred pages of reading for each class session and one to two assignments for each class due each month (though you have to consider the relative lack of free time outside the classroom). One such reason for lack of free time is the experiential aspect of the program wherein we supplement class time with site visits and guest lectures. In Berkeley, we visited many organic farms, non-profit organizations, a housing co-operative, farmers markets, among other spots. We also had activists come to us and give presentations on the work they were doing like wage labor advocacy or helping us understand the US Department of Agriculture’s Farm Bill. A core principle of IHP is the belief that our learning should not be simply confined to the classroom. This is definitely something that is simultaneously amazing and exhausting about the program. On one hand, it encourages us to radically reconsider who we consider experts, what type of knowledge production we value, and essentially the entire structure of mainstream academia. As a low-income first gen Latina, academia especially in the context of an elite institution has always felt uncomfortable. So much of the knowledge that is valued in these academic spaces in inherently coded in white affluent maleness. Being out in the field and being able to learn from people on the ground that are producing their own forms of knowledge has been incredibly important to me. One such instance was meeting Gaby (name has been changed for privacy purposes) who worked for a farmworker community advocacy group called Mi Puente. She beautifully articulated how the work she does with the organization is intimately tied to her own personal struggles, something I really resonated with. It was really validating to see that we as a group were collectively acknowledging and valuing knowledge about housing insecurity, racial and immigrant justice, food security, etc. that was rooted in emotional and personal experience. Experiences like these have made me realize that the knowledge I create which is so often informed by emotion and personal experience are just as valuable as the knowledge traditionally valued in academia that is rooted in “rationality” and “objectivity” (more on this in another blog post). Sometimes site visits can be very unstructured, like our visit to the Oakland Farmers market. 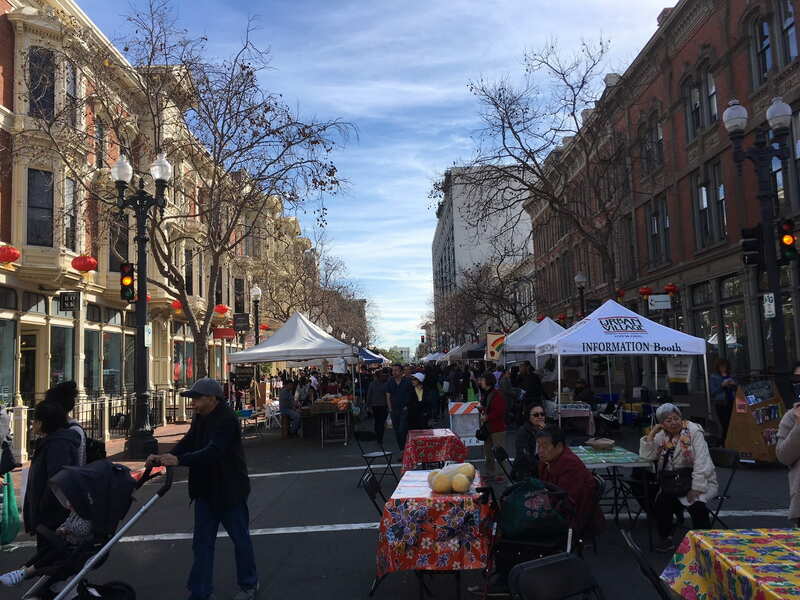 We had an entire morning to explore the market and we were free to use that time to ask vendors questions, just hang out, or do a little of both. Every day is different. Though the first couple days in Berkeley were orientation, our time in the Bay Area didn’t stay an orientation for long. A central principle of IHP is learning through doing and so before long we were doing. Perhaps my biggest misunderstanding of the program was thinking the launch site would only serve as orientation. Instead, the program emphasized that our visit in Berkeley was meant to be just as much a country visit as our visits to Malawi, India, and Italy. Throughout our time in Berkeley we learned about how food security in the Bay is intimately linked with housing insecurity, the Silicon Valley effect, racist city planning practices, among other issues. Some days we spend entirely in the classroom either listening to guest lecturers, having class, or doing community building sessions during our “community hours”. 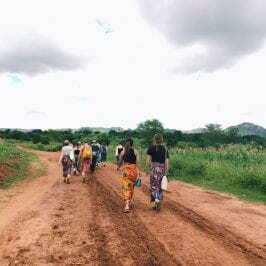 Other days we spend entirely in the field going from site visit to site visit. Most days, are a mix of both. I’ve selected a breakdown of a day that displays what a mix of those days might look like. The group traveled together from our hotel in Berkeley to a community garden in North Oakland called Dover Street Edible Park/Health Hearts Garden which is run partly by Phat Beets Produce. We were fortunate enough to get a tour of the garden from one of the founders of Phat Beets, a food justice collective based in the area. The site visit was located only a block or two away from where the Black Panther movement began, and we learned about how much of the work done at Phat Beets is influenced by this history. Especially impactful was learning about the Black Panther Party’s free breakfast program and the organization’s emphasis on meeting the immediate needs of their community before trying to gain community support for their larger movement. Something I hadn’t known before was that characterization of the Black Panthers as a “the greatest threat to international security” of the United States by the FBI in the late 60s was in direct response to their efforts to provide free breakfast to children. Throughout my time in the Bay Area, I have been considering how lack of access to healthy and culturally-relevant food can be used as a tool of oppression and, on the flip side, organizing around food security/sovereignty can be a powerful way to pursue greater liberation. Our visit to Phat Beets definitely cemented for me that food is a radical act. Phat Beets, in their efforts to connect community members in West Oakland with their own avenue to grow and harvest their own food in the community garden, has also played a role in the gentrification of the surrounding neighborhood. This is something Phat Beets actively recognized and was working to address. The organization uses their garden space and the act of growing and eating food as an avenue to bring together different members of the community and act on issues being created by gentrification. One example we heard was utilizing community cookouts as a space to educate white neighbors moving in about alternative ways to address conflict in the neighborhood other than calling the police. Here, Phat Beets was also utilizing food as a mechanism to address larger problems in the community. Our visit definitely gave me a lot to think about in terms of the ways an organization can go about addressing the unintended effects of their work. After a tour of the community garden, we split into different groups doing some garden work. My group spent roughly an hour clearing, weeding, and mulching a previously weed-ridden area. At many of the visits we were lucky enough to get involved and do some sort of work on the farm/garden which I found to be an awesome way to follow up an informational tour giving me time to process what we’ve learned. After such an overwhelming couple of days with new information flowing in constantly it was helpful to do something tangible with our hands even if it was just for an hour. We follow up our work with a lunch of jackfruit sloppy joes, vegan mac n cheese, beans and collard greens. I don’t want to exaggerate or anything but this had to have been one of the best meals I have had in awhile. Most days when we have site visits around lunch time, we have lunch at the site. On days where we’re in the classroom we are free to grab lunch wherever we want in Berkeley with our meal stipend. Travelling back to our classroom space in Berkeley on public transportation. As I mentioned earlier, our Anthropology and Environmental Science courses are shared between local faculty in each country we visit. We were lucky enough to have a retired UC Berkeley professor Miguel Altieri, an agronomist and entomologist that specializes in studying agroecological practices. This is our first class with Professor Altieri so he gives us an overview of what traditional agroecological practices look like in Latin America to get a feel for the concept. One way he did so was by explaining ecological concepts that made terrace schemes in the Andes and the Chiampas scheme in Mexico a viable way to farm. So often when studying food systems there is such a great emphasis on modernization and new and improved technologies. It was definitely important for me have a narrative switch and be able to learn about agriculture from the lens of valuing the knowledge of indigenous peoples. On a typical day, students are free from responsibilities after class ends around 5 PM, but just like anything else on an IHP schedule, it depends. Today was the only day of our time in the Bay we were required to meet after classroom hours. On this day, we all commuted to a diner to meet with IHP alumni living in the area. It was definitely interesting to ask about their experiences with the program and learn about how it had changed over the past couple years and how studying abroad had affected their career choices. After the program ends every day around 5 PM, students are free to do whatever we want in the city. Usually, I’d just head back to my hotel room or go to dinner but this evening I hiked to watch the sunset with some friends. To be perfectly blunt, not much. One of the most challenging aspects of the program is the fact that it is difficult to ever feel separate from the program. 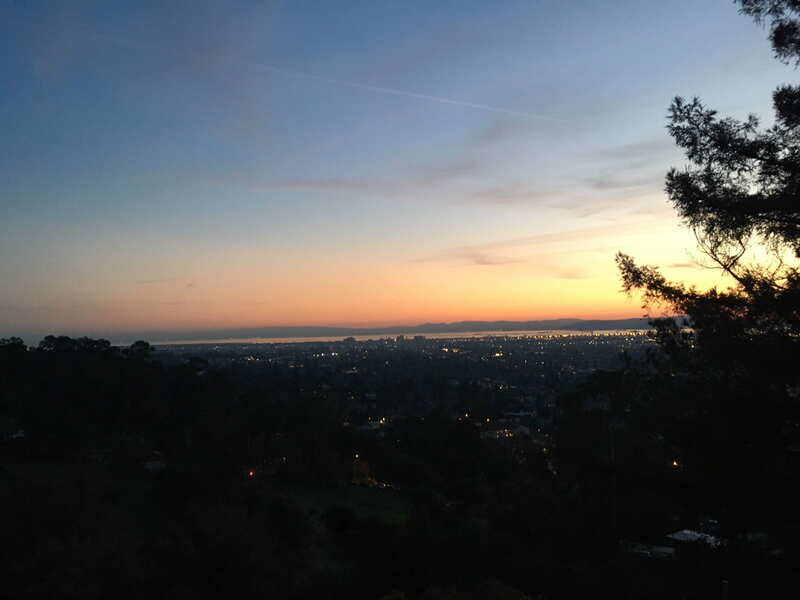 In Berkeley, we had evenings and weekends to ourselves to do as we please. Even so, we’re expected to always abide by the buddy system and if we plan to leave Berkeley for any reason we’re told to let our country coordinator know where we are going and who we are with. Our weekday schedules are jam-packed and there’s very little wiggle room to go off and do your own thing. Even if you’re not someone who is so much reliant on your own personal freedom like me, this type of program is still an incredible challenge. This format means that my usual stress coping mechanism might have to be altered, I’ll have to get used to having less time alone, and I’ll definitely have to get more used to relying on other people more. This puts an added pressure to making relationships within our learning community too. Knowing that we will be together and rely on each other almost exclusively with no reprieve for four months is daunting to say the least. Aside from being challenged to learn about myself, I’ve also found myself challenged to understand the ways in which I usually interact with my peers at Amherst and how/if I will have to alter that when my peers also become the people I spend all my time with. How do I continue to be a productive and intentional community member while also processing new and stressful situations? How does what I need from peer relationships, roommates, and friendships change when I am disconnected from my typical support system? These are all questions that the program’s structure forces you to confront. I’m already struggling to adapt in Berkeley and I can only imagine how differently it will feel as we begin our journey through the next three countries. And yet, I’m happy to embrace this uncomfortability to be able to learn about a topic I’m passionate about in three amazingly different countries with passionate people I might never have the opportunity to otherwise meet. After my time in Berkeley, I’m definitely excited to start my journey and I better understand that this program will challenge me in so many ways besides simply academically.